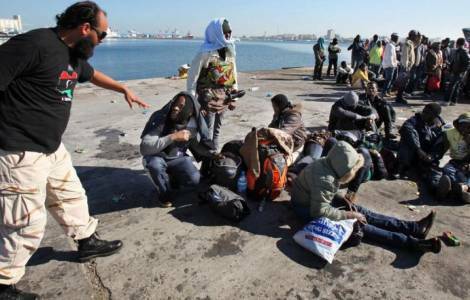 AFRICA/NIGERIA - "The sums paid to traffickers, to end up becoming slaves in Libya, could have created jobs in Nigeria"
Abuja (Agenzia Fides) - It is necessary to invest in Nigeria to create jobs, as well as to start effective campaigns to discourage Nigerians to try their luck in Europe by putting themselves in the hands of unscrupulous human traffickers. This is how His Exc. Mgr. Joseph Bagobiri, Bishop of Kafanchan, His Exc. Mgr. Alaba Job, Archbishop Emeritus of Ibadan, and His Exc. Mgr. Julius Adelakun, Bishop Emeritus of Oyo expressed themselves in an interview to the Catholic News Service. The discovery of a slave market from West Africa in Libya is provoking concern in Nigeria, where most of the people subjected to slavery are from. At the beginning of December, the Nigerian government repatriated about 3,000 compatriots from Libya. According to Mgr. Bagobiri, Nigerians were willing to pay as much as $1,400 to travel to Libya and other countries to seek a better life. "If each of such individuals had invested these amounts positively and creatively in Nigeria in viable business opportunities, they would have become employers of labor", underlines Mgr. Bagobiri. "Instead they are "subjected to slavery and other forms of inhuman treatment by Libyans". "The Nigerian government should make them realize that there are more prospects for survival in Nigeria than we think exist in Europe and other places", added Mgr. Bagobiri. "In the midst of so much wealth and resources we have in this country Nigerians should not become beggarly and only decide to fly out of Nigeria in search of the elusive greener pastures", underlines the Bishop of Kafanchan. "Many Nigerians are traveling to the developed world to enjoy the development put in place by their governments, but we have refused to develop our own country", points out Mgr. Adelakun. "Let us start to develop ours to make it attractive and conducive for living, so that foreign nationals will want to come", he concluded. ASIA/MYANMAR - Cardinal Bo: "The risen Christ removes the stones that have trapped our people"